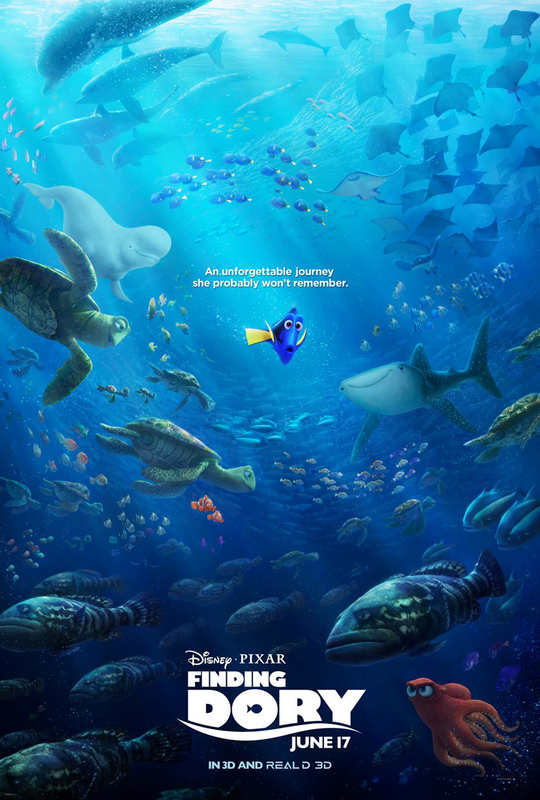 Film Review: "Finding Dory" (2016). "An unforgettable journey she probably won't remember", and that is exactly that in Finding Dory. This computer-animated comedy-drama adventure film directed by Andrew Stanton; written by Stanton, Victoria Strouse and Bob Peterson from a story by Stanton; produced by Pixar Animation Studios. It is the sequel to 2003's Finding Nemo. The friendly-but-forgetful blue tang fish begins a search for her long-lost parents, and everyone learns a few things about the real meaning of family along the way. With the critical and financial success of Finding Nemo, it was inevitable that a sequel was going to made, considering the character of Dory is the most liked character on Facebook from an Disney or Pixar with over 25 million likes. But over the past decade, Stanton denied that he was developing a sequel. Even twitting a message on his twitter reading: "Didn't you all learn from Chicken Little? Everyone calm down. Don't believe everything you read. Nothing to see here now. #skyisnotfalling" However in April 2013, Finding Dory was first announced by Disney and Ellen DeGeneres on her talk show following a long campaign for a sequel. In addition, DeGeneres and Albert Brooks confirmed that they were going to reprise their roles. During script development, the setting of the film was changed from an aquatic park to a Marine Biology Institute after the controversial documentary Blackfish (2013) was screened for the crew of Pixar. The movie was originally scheduled to be released on November 25, 2015. After Pixar's other movie, The Good Dinosaur (2015), was pushed back to that date, this movie was pushed back as well. The film features the voices of Ellen DeGeneres, Albert Brooks, Hayden Rolence, Ed O'Neill, Kaitlin Olson, Ty Burrell, Diane Keaton and Eugene Levy. The cast gave terrific performances, especially DeGeneres, with them keeping the comedic and emotional charm of the original even though the characters this time round showed little character development. Offering Finding Nemo fans a welcome return visit with beloved characters, Finding Dory delivers worthwhile family entertainment for viewers of any age. It has enough of the right stuff to remain inside the imagination long after the immediate buzz of its cuteness has melted away. It is a worthy successor to Finding Nemo and matches its tone. But it never seems content to turn over old ground. Like Monsters University (2013), it's one of those movies that has absolutely no reason to exist. It would have been a terrific movie, if the movie was funnier and wasn't so convoluted. Pixar has raised the bar for animated features so high that when they turn out a film that's merely good, instead of great, they have only themselves to blame for causing critics to damn them with faint praise. However, in the end, this minor film with major charms still deserves to have kids dragging their parents to the multiplex for one more peek at the ocean floor below. It's all fun, despite the lack of originality. Also, see my reviews for John Carter and Inside Out. "Two worlds. One destiny." This is what is at stake in Warcraft. 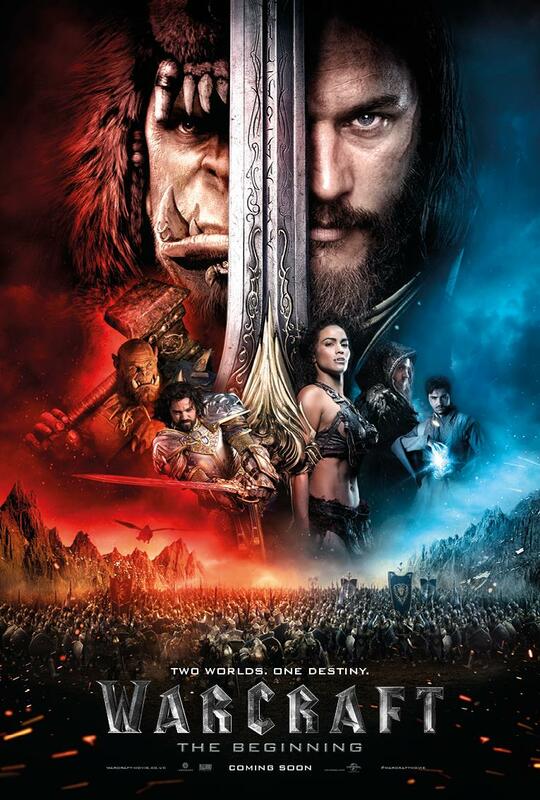 This fantasy film directed by Duncan Jones; written by Jones, Charles Leavitt and Chris Metzen; based on the Warcraft video game series and novels. The peaceful realm of Azeroth stands on the brink of war as its civilization faces a fearsome race of invaders: orc warriors fleeing their dying home to colonize another. As a portal opens to connect the two worlds, one army faces destruction and the other faces extinction. From opposing sides, two heroes are set on a collision course that will decide the fate of their family, their people, and their home. The film was first announced in 2006 as a project partnership between Legendary Pictures and Blizzard Entertainment. Originally, Sam Raimi was set to direct. Ultimately, Duncan Jones replaced Raimi in January 2013. Immediately taking the helm, Jones voiced his dissatisfaction with the script. Jones said that the original script was very one sided in terms of the two factions. He soon made major edits to the script, so both factions could tell their side of the story. Jones said that the Warcraft universe is very "High Fantasy" or in other words very eccentric and planned to make it feel more grounded in reality though at the same time keep the look and feel of the games in the film. The source for the movie adaptation is being taken from the books Rise of the Horde, which tells how the Orcish Horde was formed; as well as The Last Guardian, which shows the human side and reaction to Orcish invasion. During production and filming, lifesize weapons and suits of armour were built for the orcs despite the orcs being played by actors via motion capture. This was mainly for photographic references and so that they could use them as props on the set. The film went through 20 months of post production. Thomas Tull, the CEO of Legendary Pictures and producer of the film, said that the things Jones and the special effects team are doing are truly on the cutting edge. So the film was pushed back to May 2016 from their original December 2015 release date. In addition to the extensive post production process, the film was passed back in order to avoid the release of Star Wars: The Force Awakens (2015). The film stars Travis Fimmel, Paula Patton, Ben Foster, Dominic Cooper, Toby Kebbell, Ben Schnetzer, Robert Kazinsky and Daniel Wu. The performances given by the talented ensemble were lacklustre, to say the least. Fimmel, Patton, Foster and Cooper were horribly miscast in their respective roles. Despite an effective otherworldly atmosphere and spectacular visuals, Warcraft suffers from its poorly constructed plot, an ensemble of wasted and miscast talents, and its comically desperate attempt to be the video game movie to change the trend of consistently bad video game movies. With a heavy heart, it hurts for me to say that Duncan Jones gave an admirable effort, but ultimately he and millions of video game fans have to accept the fact that it can never be done. Film Review: "The Conjuring 2" (2016). The next true story from the case files of Ed and Lorraine Warren comes The Conjuring 2. This supernatural horror film directed by James Wan, and written by Wan, Carey Hayes, Chad Hayes and David Leslie Johnson. It is the sequel to the film The Conjuring. Lorraine and Ed Warren travel to north London to assist the Hodgson family, a single mother raising four children alone, who are experiencing poltergeist activity filled with malicious spirits at their Enfield council house in 1977. In July 2013, Variety reported that New Line Cinema was already in the early stages of development of a sequel, following the positive test screenings and reviews of The Conjuring. The initial screenplay for the sequel was by original scribes Chad and Carey Hayes and director James Wan, which was revised by Eric Heisserer. In January 2015, David Leslie Johnson had been enlisted to provide additional script rewrites. The film deals with the case of the Enfield Poltergeist, which took place in the London Borough of Enfield from 1977 to 1979, and involved the alleged haunting of two sisters, aged 11 and 13, at their mother's council house. In February 2014, it was confirmed that Vera Farmiga and Patrick Wilson were set to reprise their roles of Ed and Lorraine Warren. In October 2014, it was announced that the film was pushed to June 2016 from its original October 23, 2015 release date. In addition, Wan was confirmed to return to direct, and that production would begin in the summer of 2015. "I feel rejuvenated to tell a scary story one more time", Wan said on Instagram. In September 2015, Frances O'Connor, Simon McBurney, Franka Potente, Simon Delaney, Maria Doyle Kennedy, and newcomers Madison Wolfe, Lauren Esposito, Patrick McAuley and Benjamin Haigh joined the cast. In December 2015, it was confirmed that Sterling Jerins would reprise her role as the Warrens' daughter Judy. Principal photography began in September 2015, in Los Angeles. Due to inexplicable eerie events during production of the first film, a priest from the Roman Catholic Archdiocese of Santa Fe was brought in to bless the set on the first day by the film's producers. Production then moved to London in November 2015. Filming concluded in December 2015. The film stars Patrick Wilson, Vera Farmiga, Frances O'Connor, Madison Wolfe and Simon McBurney. The cast gave terrific performances, with Wilson and Farmiga delving deeper into their characters and relationship. The new additions did a terrific job of maintaining the human drama, and making feel real as opposed to silly and cliched. The Conjuring 2 is surprisingly not short on the tension and surprises that made its predecessor so chilling. The film is artfully eerie, thanks to Wan's masterful direction, Don Burgess' cinematography and the pervasively unsettling score created by Joseph Bishara. Setting aside the movie’s tediously busy script and its few predictable scares, the scares are mostly very scary indeed, and that means the film has done its job. Also, see my review for Furious 7. 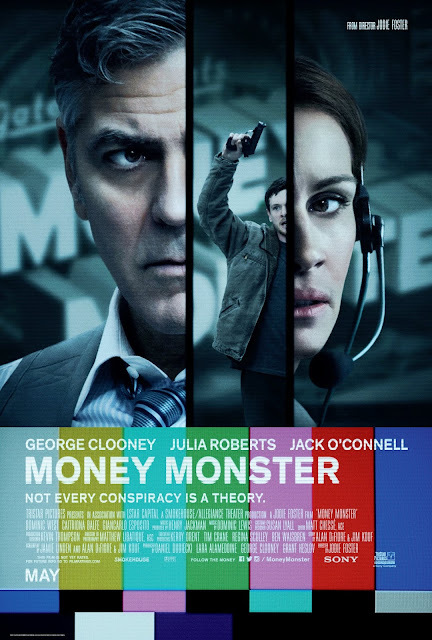 Film Review: "Money Monster" (2016). "Not every conspiracy is a theory", it is something to consider after watching Money Monster. This thriller film directed by Jodie Foster and written by Alan Di Fiore, Jim Kouf and Jamie Linden. TV host Lee Gates and his producer Patty Fenn, are put in an extreme situation when an irate investor who has lost everything forcefully takes over their studio. During a tense standoff broadcast to millions on live TV, Lee and Patty must work furiously against the clock to unravel the mystery behind a conspiracy at the heart of today's fast-paced, high-tech global markets. The project was first announced in February 2012. In October 2012, Jodie Foster was set to direct the film. Foster's first choice for the role of Lee Gates was none other than George Clooney. Clooney was officially cast in July 2014, as well signing on as co-producer. Jack O'Connell and Julia Roberts were added to the cast in November 2014. By early 2015, Caitriona Balfe and Dominic West had joined the cast. Originally slated to shoot in early 2013, principal photography began in February 2015, after several delays. Filming took place on Wall Street in the Financial District, Federal Hall, William Street and Broad Street in New York City. When commenting on the theme of the film, Foster said "the outrage is shared by all... one of the ways the financial world has been able to orchestrate the power that they have is by making it all so complicated so that regular people can't understand it... they created a system that's impossible to understand, so that they can benefit from that misunderstanding." She added further "And there are a few people who have the keys to that, and those people who have those keys are the ones that benefiting most financially... we know that's true, we've known that's true for a very long time... I think this film doesn't say the system doesn't work, I think it's saying that there are lots of abuses and there are lots of opportunities for abuses, and we certainly saw that in 2008. Now the financial world has to justify new ways to abuse the system." The film stars George Clooney, Julia Roberts, Jack O'Connell, Dominic West and Caitriona Balfe. The cast gave brilliant performances despite their characters suffering from lack of further characterisation that could have made them all the more real and compelling as the drama unfolds. Money Monster is an outrageous, brilliant, cruelly funny, topical American film whose wickedly distorted views of the way modern media and financial world is and works, is at the heart of this film. It captures today's zeitgeist, a time when optimism is scraping rock bottom and that the character of Kyle Budwell is another voice that cinema has conjured up as an outcry to the ever complacent world. Even though the filmmakers stayed with tone of a lively journalistic story, the film's strong, fast-paced story tended to drag as it couldn't avoid the cliched reflection and/or a contemplative view of life.